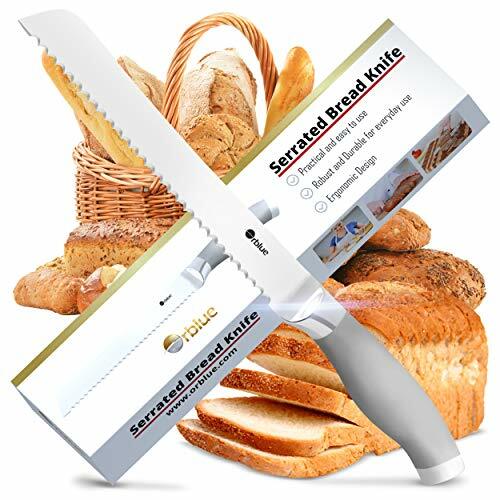 This high-quality stainless steel serrated bread knife is the perfect gift for moms, cooking enthusiasts or culinary students. 1. It features one-piece construction, and an ultra-thin, razor sharp edge that cuts through even the finest pastries like butter. 2. The blade is only 2.2 & 0.1 mm thick so there's near zero resistance while cutting. 3. The long 8" blade allows you to cut through extra-wide loaves of bread with only one or two easy strokes. Total Length: 12.79 inches, Blade to handle: 8 inches, Handle Length: 4.9 inches, Blade Width: 1.18 inches. Effortless slicing for tough pineapples & delicate tomatoes too! One-piece design - No plastic, wood parts or screws that tend to move & wear out. The perfect gift! If you have any questions about this product by Orblue, contact us by completing and submitting the form below. If you are looking for a specif part number, please include it with your message.